Step 1: Invite everyone over. We could have done this as a professional meeting at our library, but instead I chose to invite staff and neighboring librarians over to my home. I wanted this to be a fun, social event first (and sneaky professional development second). It's a chance to hang out with our neighbor youth librarians and get to know each other a little better. You could also extend the invitation to your local school media specialists, reading teachers, art teachers, or anyone you want to share some fun professional development time with. Starting about a month before the party, I collected as many eligible books as I could get my hands on. I checked them out on our children's department card so that patrons knew they weren't on the shelf and I left them on a cart at our reference desk for staff to look through. Then I brought them all back to my apartment for the party. Step 3: Add food and drink. This is a party, after all! We started the evening with make-your-own tiny pizzas on English muffins. It was a nice chance for everyone to chat, introduce themselves, and share some food before we got started. Step 4: Read the books! After people had finished eating, I encouraged them to grab some books from the giant stacks and begin looking through them. Provide paper and pens for people to jot down notes or list their favorite titles. We went through the criteria so that people knew what to be looking for and we had a discussion about the audience for picture books, how picture books are not just meant for preschoolers or children who are just learning to read. In retrospect, I would have had my staff look through and choose a selection of 12-15 of their favorites to discuss at the party. Although it's fun to look through tons of picture books, it was way too many to meaningfully look through at the party, especially for those not in my department who hadn't had a couple of weeks of access to them already. I think if we had narrowed it down we would have had a deeper discussion about the books. Step 5: Vote for your favorites. We did two rounds of weighted voting. For the first round, I asked them to pick their top four and list them in order. Their first choice got 4 points, their second choice got 3 points, and so on. We had a pretty clear top five after this round of voting, with a tie for the top choice. So I pulled out the top five and we did another round of voting. This time, everyone picked their top two (again, weighted). Doing two rounds of voting was important, especially with such a large field to choose from. There were several books that only got one vote from someone, so doing the second round forced some people to consider totally different books than they had in the first round. Step 6: Announce your winners! After two rounds of voting, we had a clear winner and a clear honor book. 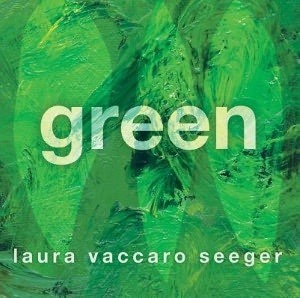 Our Mock Caldecott Medal went to Green by Laura Vaccaro Seeger! 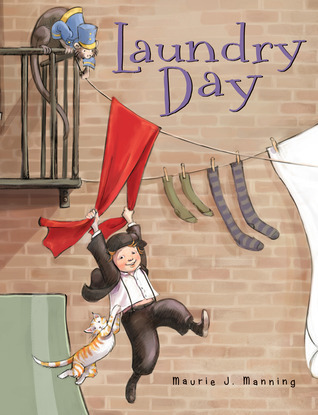 And our Mock Caldecott Honor went to Laundry Day by Maurie J. Manning! And Then It's Spring by Julie Fogliano, illustrated by Erin E. Stead. Bear Has a Story to Tell by Phillip C. Stead, illustrated by Erin E. Stead. Brothers at Bat by Audrey Vernick, illustrated by Steve Salerno. Chloe and the Lion by Mac Barnett, illustrated by Adam Rex. Mice by Rose Fyleman, illustrated by Lois Ehlert. Mom, It's My First Day of Kindergarten by Hyewon Yum. More by I.C. Springman, illustrated by Brian Lies. Nightsong by Ari Berk, illustrated by Loren Long. Ocean Sunlight by Molly Bang, illustrated by Penny Chisholm. One Cool Friend by Toni Buzzeo, illustrated by David Small. Red Knit Cap Girl by Naoko Stoop. Step Gently Out by Helen Frost, illustrated by Rick Lieder. This Moose Belongs to Me by Oliver Jeffers. Z is for Moose by Kelly Bingham, illustrated by Paul O. Zelinsky. Step 7: Gather your staff and get someone to cover the desk so we can all watch the live webcast of the Youth Media Awards together! I doubt any of my staff have ever watched the webcast of the awards before, but this year we're all going to do it together. I've asked our Circulation Manager if someone from her department could watch our desk for an hour or so and she agreed. Now that we've spent time thinking about our favorite picture books, I'm excited for us all to watch the live announcements together and see if any of our favorites won!